For every marijuana grower, achieving a high final yield is the ultimate goal. In an ideal world, this yield will be high despite less effort, time, and money being used. There are a number of factors that can negatively affect your yield, so as a grower you need to always be aware and ready to combat these things to ensure a great yield. What are the main things that can affect your yield? They are light intensity, pruning or training, nutrients, climate issues, and the harvest time. All five of these factors can lead to successful yields, but if they are not handled correctly, then they also have the potential to devastate your marijuana crop. You, therefore, need to be well informed and ready for any unexpected hurdles that might come your way. For example it’s very important for your plants to get the right amount of nutrients, so they can grow strong and healthy. An excellent product such as Marijuana Booster, will give your plant plenty and a variety of nutrients it needs and this can substantially make a difference in your yield. More than anything, the genetics of your marijuana plant are going to have the greatest effect on the final yield. Make sure you choose a strain with a high potency and yield to begin with so you ensure that you can maximize your crop to an amazing extent. You will know your plants are having an issue with the intensity of the light by the way they are growing. For instance, if your plants are in their vegetative phase and are not receiving a high enough intensity of light, they will “stretch” upwards toward the source of light. This can lead to large spaces on the stem between nodes and leaves, or perhaps even growing tall enough to fall over. Tall, lanky plants are not the type of plants that are going to get you a high yield – bushier plants will. Once these stretched out plants have reached their flower phase, it will be difficult to get them an adequate amount of light to increase their bud growth. 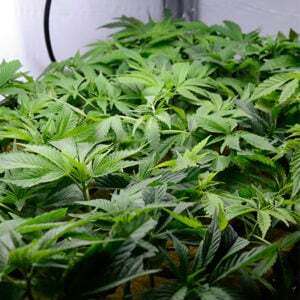 To keep it simple, more light intensity leads to more (and bigger) buds. It’s, therefore, easy to understand why it’s such an important factor for your marijuana garden. Light is by far the most important factor that can affect any marijuana plant. It is absolutely essential for the flowering phase of your marijuana plants, although many new growers don’t fully appreciate how much increasing the light intensity during that final stage is going to help their end yield. The process photosynthesis is fed by intense sunlight, which creates sugar, which is used for the flower growth of your marijuana plants. Uninterrupted darkness is equally important since this is the time that the plant can produce and let off the hormone florigen – if it doesn’t do this, it will not flower. If your plant is experiencing a problem due to the improper intensity of the light, there are several methods you have at your disposal to combat the problem. Generally, more intense light leads to bigger and fatter buds. This, of course, means a greater yield – and greater success for you as the grower. It’s especially important to have high amounts of light intensity during the flowering phase since this is when your plants are going to grow their buds as much as possible. This is the easiest to achieve if all of your plants are the same height, with lots of colas close together. This is more or less impossible to achieve after your plants have already entered their flowering stage, so if they have grown unevenly then you will just need to work your hardest to make them receive intense light nonetheless. The tricky part about increasing the intensity of the light in your grow room is to not simultaneously increase the temperature of the room, as the plants need to remain cool during their flowering phase. One simple way of increasing the intensity of light in your grow room is to move the light so it is positioned closer to the plant. This has to be within reason, of course, so as not to burn your plant’s tips. Remember: the best way to increase the size and potency of all the buds is to have each one exposed to direct, intense light. In general, there is a low chance of you giving your plants too much light. Marijuana plants use up lots of light in the wild, so to surpass the point of too much would be surprising. As long as the light isn’t too close to your plants, you won’t have a problem with light levels being too high. Although it might not seem like it is directly related to light, CO2 is another important factor that comes into play. CO2 enables your plants to take in more light than usual. Unless you are reaching the point of the light being too much for your plants, however, adding extra CO2 into the grow room is most likely a waste of time. If you are reaching this point, CO2 will be extremely beneficial to your plant’s end yield. If you are planning on adding CO2 to your grow room, make sure you seal off the area completely so you can pump in extremely high amounts of CO2. This density of CO2 is dangerous for humans, so don’t walk into the room with the excess CO2 without taking proper precautions first. If your plants are receiving uneven amounts of light, meaning the tops of your plants (which receive the most direct sunlight) are growing more rapidly than the bottom sections of your plants, you may want to look into pruning and/or training your plants. This factor goes hand in hand with light intensity since it will have a direct effect on the coverage and distribution of the light. Training and pruning allow your plants to become bigger and wider, and it is free and relatively simple to achieve. You can either top your plants (which utilizes the method of taking off the tops of your plants) or use Low-Stress Training or LST. Many growers prefer LST since it keeps the stress levels of your plants to a minimum (as the name suggests). 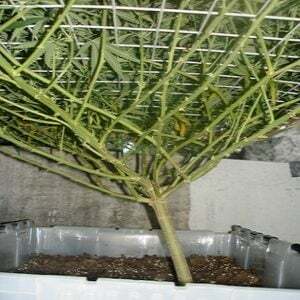 LST’s idea is to coax your plants into growing flat and wide rather than tall and thin. It uses bending to achieve this goal. If you are planning on using LST, you should start when the plant is still quite young. The ideal shape of a plant that has undergone LST is easiest to accomplish if you start from a young age. Instead of bending and tying your plant, you can also use a screen or netting to guide your plants’ growth to being more flat and wide. This method is referred to as Screen of Green. If you want to train your plant a little bit differently, you should look into the method of Supercropping. This can be used on its own or to accompany another training technique. It is a way to force plants to bend when they don’t want to bend. As far as actual pruning goes, the most popular method for marijuana growers is called Topping. Another popular method is FIMing the plant. Both methods include removing growth from the end of the main cola. If you do this at a young enough age, the result will be that the plant will stop focusing all its energy on this one cola. Instead, it will focus on the other colas that are full of buds instead. This ultimately leads to a higher yield. If your plants have sudden leaf discoloration, curling of the leaves, death of the leaves or other strange symptoms, the cause could easily be from too little (or too much) of one nutrient. There is the common identifiable problem called “nutrient burn” that shows your plants are receiving too many nutrients. Just like people shouldn’t fill their plate with multi-vitamin pills, you shouldn’t bomb your plants with nutrients. Too many nutrients make both humans and plants sick. Your plants’ leaves are always the first place to show nutrient problems. Therefore, if the leaves of your plant all look similar and bright green, you can rest assured that there is no problem with your plant. Contrary to what some new growers might assume, adding more nutrients will not automatically make your plant more well-nourished. You need to know exactly how much of each nutrient your plant is going to need, and during which phase. Sound complicated? That’s because it is. Lots of growers have developed the bad habit of giving their plants too many nutrients. Another common mistake is when growers who haven’t fully educated themselves mix lots of nutrients together before adding it to their watering solution, without really knowing why or what they are feeding their plants. There is a tendency to add too many nutrients. Too many nutrients lead to poor plant health (therefore doing more harm than good). You need to make sure you don’t let this happen. Download my free marijuana grow guide at this link for more on nutrient problems. Nutrient deficiencies are also detrimental to the health of your plants, so you need to find the balance between the two extremes. It is actually generally the safer option to err on the side of too little nutrients. If you use bottled nutrients, we recommend using only half of the suggested amount of nutrients. Simply do not raise nutrient levels unless you are noticing specific changes in your plant (i.e. leaves turning yellow at the base). You can also do it when you realize one particular plant uses a lot more nutrients than its neighbors. You will be surprised by how different the ideal amounts of nutrients are from plant to plant. In general, it’s better to have fewer nutrients during your plant’s final 2-4 weeks before the harvest. If you see leaves dropping during this time, do not automatically assume it is a nutrient deficiency and start adding more nutrients. This will actually slow down your plant’s bud development, therefore resulting in a lower yield. Fewer nutrients during this time will also allow your buds to get rid of any residual “nutrient taste” that sometimes comes with plants that have been receiving too many nutrients. Don’t be afraid to allow some of the leaves to yellow, die, and drop off – it allows your plant to focus its valuable energy on high-quality bud growth instead. The best way to avoid nutrient problems altogether in soil-based mediums is to form your own compost to make super soil. It can be totally organic and will give your plant every nutrient it needs throughout its entire life. You won’t need to worry about deficiencies and toxicities and can instead use your time and energy elsewhere. Another option is like we mentioned before the Marijuana Booster. A great product composed of the exact right mix of nutrients to help the plant thrive and double your yield. If your plant (or one particular spot on the plant) begins turning brown and wilting, you can be relatively certain that the excess heat is to blame. Excess or sudden cold will also lead to slowed growth and other negative consequences, so make sure to avoid this at all costs. You need to maintain a steady, healthy climate for your plants to produce their maximum yield. A too high or too low temperature will result in a poor yield, as will improper levels of humidity. Make sure to always keep the temperature of your grow room within a certain, consistent range to keep your plants from slowing growth or having other negative side effects. If you keep the temperature and humidity level at the right spot, the final harvest will be rewarding. Even the smell and potency of the buds will be improved, so don’t forget about this crucial factor when it comes to maximizing your yield. You will know you have chosen the wrong time to harvest if your buds aren’t fully ripe, or if they’re unusually small. Chances are, you cut your potential by about 25% by harvesting too early. If you wait too long, however, you will also lose some potency and smell. There is a small window of time that is ideal for harvesting the buds of your marijuana plants. This window of time is between two and three weeks long. You need to ensure that you are waiting long enough to allow the buds to ripen completely. The final two or three weeks before the harvest can make a world of difference – buds can grow up to 25% more during this time! This is why it’s very important not to harvest earlier than the optimum window. If you are trying to get a specific high from your buds, you can alter the harvesting schedule a bit. Buds harvested earlier generally have a buzzy high, best for smoking during the day. Later harvests lead to a high that is more relaxed couchlock feeling. Decide when you will harvest based on your personal preferences. While these five factors are the most common ones that can affect your marijuana plants’ end yield, they are by no means the only factors that have an effect. There are plenty of diseases or conditions that could affect your plants without you influencing it at all, so you need to be well-educated in terms of potential obstacles. If you do your homework and are proactive about your plant care, you will be finely rewarded. Check out our Symptom Checker for more plant symptoms. While there is nothing you can do after you have already purchased and planted your seeds to affect this, it is still worth mentioning that genetics play a key role in your plants’ final harvest. Your particular marijuana strain is going to affect the growth, size, and potency of your buds in the end. The good news is that most strains that you are likely to buy these days have significantly higher yields and potencies than past strains. They are also generally easier to grow, and this is just getting better and better as time goes on. Many beginner growers will pay the cheaper price for strains that are not high in quality. Although their intent was to save money, in the end they will actually get less value for what they paid because the end yield will be disappointing compared to a high-quality strain’s yield. This is why it is important to invest in high-quality genetics from the beginning. There are different versions of high-quality strains, of course. Some strains achieve a higher yield, sure, but others have been bred specifically to achieve other useful characteristics like height and bushiness. Others were bred to have buds that are extremely potent or fragrant, meaning the yield itself might be lower, despite a higher quality bud. Therefore, no matter what you do in regards to the other factors that affect your precious marijuana plants, you need to start things off right with a good strain. Do your research so you know exactly what that strain’s tendencies and expectations are. In the end, you will be glad you did. If you want to skip further research and just start with quality seeds with a strong genetic background, then order your marijuana seeds in my seedshop. Shipping is stealthy and goes worldwide. As a beginner it is best to start with White Widow Feminised seeds. It is not recommended to remove all the leaves from a plant. This decreases yield. Thanks for all the help you provide. One problem I'm experiencing is obtaining seeds in the USA. Can you asdvise me on how to get my hands on seeds safely? I have run into dead ends constantly. If you want quality seeds you can check out our seed shop. We ship worldwide. Jennifer, I'm Canadian. Are you making seeds available here now that we can legally grow. Thanks, great info as I approach my first grow ever...Northern Lights, here we come! Since many subscribers are spread worldwide it is not cost effective to order your nutrients and request that you inform us of the nutrient composition. Cost of transport makes this prohibitively expensive.for South Africa. Please help. Could i have a rough idea of UK postal times? Thank you for your bible, as it really gave me a lot of information. I can get advice from friends ,but some times it can be confusing and conflicting. You've made it easier and a lot more understanding. bought 3 seeds for 10. 00 per seed only 2 germinated 1 doing ok other trying to make it other never germinated very disapointed in the out come so far for the price of the seeds! Hey Cathy, please contact our customer service at [email protected] maybe they can be of some assistance. Good to hear Doug! Happy harvesting! Hey Cathy, I feel ya boo. The same thing happened to me. Hi Sylvia if you experienced the same. Please contact our customer service at [email protected], they will help you out. The best thing you can do is to join our free support forum. We have expert and fellow growers there that would love to help with anything grow related. You can post pictures, ask questions and share experiences. So sorry you feel like our service is dishonest, I checked the email history and I must say, this is not the entire story. If there are any order issues please contact our customer service. This is not true. I have honestly never heard of anyone that did not get seeds replaced after a propagation failure. In fact; We replace seeds even though it might be the growers fault. By How Much Sunlight Do Outdoor Marijuana Plants Need? By How To Setup A Low Budget Indoor Marijuana Garden? What is FIMing? I'm just curious. Thanks. I am growing earthworms to use the casting as an organic fertilizer. Will this be a sufficient nutrient. I was also told that rose food would positively affect my bud growth. Any input? This may be a strange question to you. WHAT IS A COLA, I am assuming it isn,t a soft drink!! Matfucius say, "Worm crap with a little sulfur mixed into soil, makes for a good PH". Also Matfucius say, "Water only with spring water". That aside, these are the only people I'll ever get seeds from. Outstanding genetics. Growing some super Gorilla Glue. Using three 1,000 watt LED lights. Using low stress training technique to obtain bushy plants. Lots of future colas developing. No hope without dope ! Got the Bible,checks in the meal. I have tried several times to download the grow bible but it will not download. Is it ok to bring outdoor plants inside at night into a dark room so they dont get ripped. Can co2 be used at night phase.